Jackie Brown is a 1997 crime film written and directed by Quentin Tarantino. It is based on the novel Rum Punch by Elmore Leonard. This film is the only adaptation of a novel Quentin has done. Starring Pam Grier, Robert Forster, Samuel L. Jackson, Robert DeNiro, Bridget Fonda. 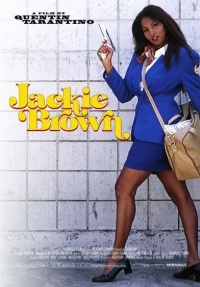 Tarantino provides a solid homage to the blaxploitation films of the 1970's with Jackie Brown. The film centers around a flight attendant (Pam Grier) who is stuck in the middle of a sting operation between the feds and an arms dealer (Samuel L. Jackson). Struggling with her career, she tries to play all sides to emerge with a financial farewell present. This page was last edited on 4 September 2015, at 11:55.